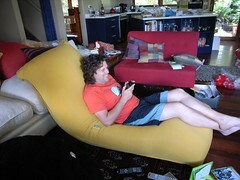 ... a new Xbox and a man-sized bean bag. I know I'm a glutton for punishment, given Phil's fondness for computer games, but I just couldn't resist shocking the pants off him by getting him an Xbox for Christmas. After he recovered, he said it was like giving an alcoholic a bottle of rum, but I figure he'll be so ridiculously busy with work this year he'll hardly have time to scratch, let alone play on it. The bean bag was a Woodford purchase, and it is soooo comfy.